Dante closed East of Malacoda. Note vandalism . Not all 463 acres are open, only the Upper Purgatory trails of Dante to Malacoda and Paraiso. Hiking all three trails is roughly three-and-a-half miles in length with little backtracking. Trail maps are found on our website http://smgreenbelt.org/forms/purgatory_8.5x11_map.pdf and were updated in 2015 by the city’s GIS Department. 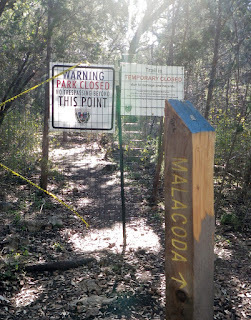 Trail users are asked not to stray into closed sections of the natural area as work continues to clear a safe pathway. Debris is still hanging in trees and the one-to-three feet of duff hide limbs and other debris that can cause harm. Volunteer crews are working three days a week to bring the trails back to a safe level but Ovid, Beatrice, Nimrod and Ripheus were all impacted by the flood. See previous posts to this blog to learn how you can assist with bringing the trails back.